Living in Anaheim means you’re going to be very popular during the holidays, especially with out of town guests. Disneyland is already the “happiest place on earth” but at Christmas time, it gets even happier. It is also the perfect time for families with kids on holiday breaks to pay a visit. If you’re anticipating guests this year, then you’ll want to clear out that home storage unit before they show up. No this isn’t a traditional storage unit with an orange roll up door. Instead, we’re talking about those areas in your home that have become a storage unit by default. The most popular home storage unit area is the garage. When your garage has become overrun with clutter, the next call you should make is to Junk King. Junk King is part of a national franchise of professional junk haulers. Being professional goes hand in hand with being experienced. When it comes to junk pick up, our crews have seen it all. You might think you have the worst collection of clutter in Anaheim but there will always be someone with more junk. Bottom line: you don’t have to be embarrassed about your junk. The friendly folks working with Junk King will have it all removed without giving it a second thought. 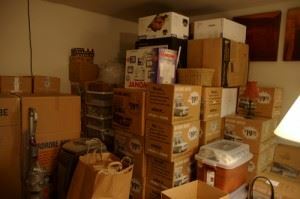 To help the crew with the home storage unit cleanup, you’ll want to sort through your stuff before the appointment. You don’t want to keep the crew standing around while you figure out what should go and what should stay. That includes anything you want donated. Junk King will automatically be setting aside those items that could be put to use by a charity. That’s part of the complete junk removal package offered by Junk King. You should take full advantage of the Junk King crew when they show up. Even if you told them on the phone that you just want your garage cleared out, you can still add items to the truck from your closets, attic or yard. Just let the crew know before the work begins about everything you want taken away. That way they’ll be able to provide you with a fair rate for the junk removal based on how much space your items will use on the truck. That will be a flat fee that covers all the labor, time, truck rental and dumping fees. Before your home becomes a storage unit, turn your clutter over to Junk King. This entry was posted in Don't Turn Your Anaheim Home Into A Storage Unit and tagged Junk King, junk removal, Storage Unit on October 30, 2014 by Junk King. Last updated July 31, 2017 .